We are here for you to be informed and educated. We are a small private foundation with very limited funding and staff. What is provided in the writing, media, and images are solely for your information. This cannot be a substitute for professional medical or mental health diagnosis, advice or treatment. Designing Brighter Tomorrows was incorporated in 1995, and is a private non-profit foundation. The startup funding costs were met with private donations from the founder and her family. Initially, community training was provided in the area of helping youth with grief. Also, a lending library was available for many areas of life changes. With the advancement in the use of the internet, we are now making this information available through this website and social media. Our vision is for it to grow to be an extensive resource of information, and will be accessible to those with a variety of needs and abilities. In 2004, Willow Lee, a dear friend of our founder and director, went through a brief final illness. She had been a hospice nurse for many years, and had always been on the other end of the caregiving process. Her request was that what was done for her in her final months of life by her family of friends could be taught to others. A bequest was left for this purpose. That information will be found in the area of caregiving. 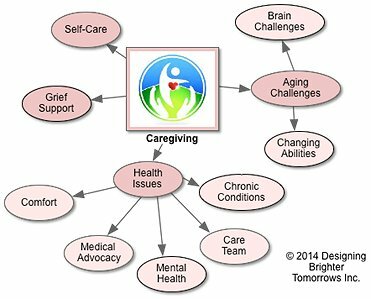 The plan is for this information to be expanded to provide many resources about caregiving, caregiver self-care, grief support, aging challenges, and understanding health issues that are common in the second half of life. Linda Marsolek, MS, CSA, is the founder and director of Designing Brighter Tomorrows. She has a BS in Social Science, and a MS in Research and Statistical Methodology. She also is a Certified Senior Advisor. Linda has been dedicated throughout her lifetime to bringing information to and mentoring others so that they may thrive and grow. Please enjoy exploring our website. It will continue to have new offerings, so be sure to bookmark us and check back often.